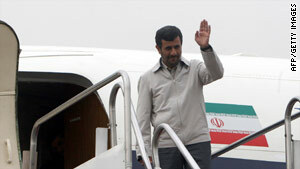 Iranian President Mahmoud Ahmadinejad departs Tehran for the United States on Sunday. Ahmadinejad calls nuclear stockpiles "biggest threat to the world today"
He claims to have proof Washington is "the root of world terrorism"
But he asks U.S. to engage with his government, urges "companionship"
(CNN) -- Iranian President Mahmoud Ahmadinejad left Sunday for the United States to take part in a conference on nuclear nonproliferation, a Foreign Ministry spokesman told state television. Ahmadinejad will address the the United Nations Nuclear Non-Proliferation Treaty review conference in New York on Monday, spokesman Ramin Mehmanparast told Iran's News Network. "The biggest threat to the world today is the production and stockpiling of nuclear weapons," he said. "Unfortunately the [International Atomic Energy Agency] in the past 40 years has not been successful in its mission. We have no disarmament or nonproliferation and some countries have even procured the nuclear bomb during this period," Ahmadinejad said Sunday. With the United States pushing for new international sanctions against Iran over its refusal to halt its nuclear program, Ahmadinejad said Saturday that his nation "cuts any hand that signs a document against Iran," according to the semiofficial FARS news agency. Ahmadinejad began his trip a day after saying he has proof that the United States and Israel are linked to the world's leading terrorist organizations, according to state-run media. "We have documents that prove [Washington] is the root of world terrorism," Ahmadinejad said in a speech in Tehran, Press TV reported. "It has been aiding and abetting extremist groups over the past years." The United States "is the only country to have used the atomic bomb in military conflict," Ahmadinejad said Saturday, according to Press TV. "They even admit themselves that they resorted to using [similar weapons] during the war they waged on Iraq." The U.S. State Department said Friday that it is granting some of the visas requested by the Iranian delegation planning to attend next week's conference but would give no details about a visa for the Iranian president.